The greater part of the Book of Mormon was written before Christ’s coming. It begins about 600 BC during the reign of King Zedekiah. The Bible ends its narrative in about 400 BC. The Book of Mormon gives the prophetic word of God during the period of time which is called the “intertestamental period”, a term used to refer to a period of time between the writings of the Hebrew Bible and the Christian New Testament texts. Traditionally, it is considered to be a roughly four hundred year period, spanning the ministry of Malachi (c. 420 BC), the last of the Old Testament prophets, and the appearance of John the Baptist in the early 1st century AD. It is known by members of the Protestant community as the “400 Silent Years” because it is believed to have been a span where God revealed nothing new to his people. The next 200 years pass quickly in the Book of Mormon. Even though our current Book of Mormon is an abridgment, it is evident that God spoke to his prophets during this period. There were periods of wickedness and righteousness among the Nephites, the ones who kept the records, yet we know that they had prophets who continued to teach them. Undoubtedly the more complete record would be replete with the testimony of prophets. The records were handed down father to son to brother. Amaleki, one of the later prophets during this period, bore the following fervent testimony of Jesus. A very concentrated portion of the Book of Mormon covers the 130 years before Christ’s birth. It is rich in the testimony of Jesus born by prophets and other religious leaders. The gospel of Jesus Christ is taught with clarity and truth. It shows that the people continued to keep the Law of Moses as means to point their hearts and minds to Christ. The Book of Mormon shows how merciful God is as He continues to communicate to His children through his prophets during this time. He was preparing a people for the coming of his Son. Why would this occur only among the Book of Mormon people? One answer might be that they were free from the oppression of foreign governments and entanglements. They were also free from the reign of tyrannical kings. About 93 BC the form of government among the Nephites peacefully changed from a reign of kings to a democracy with elected leaders. This could possibly be the first democratic government in recorded history. 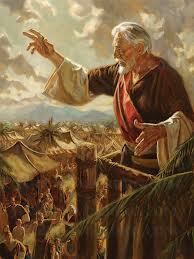 The political leaders in the Book of Mormon were often their spiritual leaders. Freedom of religion was paramount. Indeed wars were fought to protect religious liberty. Their religious freedom was essential for the prophetic word to be taught without hindrances. Although their government was corrupt at times, prophets could still preach the truth, testify, call people to repentance and expose corruption. It appears that God had preserved a people and a government to whom he could reveal his truths during this intertestamental period. This entry was posted in prophets, Testimony of Jesus and tagged Book of Mormon, Church of Jesus Christ of Latter day Saints, faith in Christ, intertestamental period, Jesus Christ, prophets, testmony. Bookmark the permalink.